Sharon started coming to Radix Performance Centre in January of 2016, encouraged by her son, Coach Frazer! Sharon was already active, curling 2-3x/week each winter after spending 30+ years as a Highland Dancer. However, after having both of her knees scoped to repair tears to the meniscus, she felt like she wasn’t functioning at her physical potential. Sharon was definitely already strong coming in to training, deadlifting 100lbs with ease and showing great enthusiasm and energy in her met-cons. 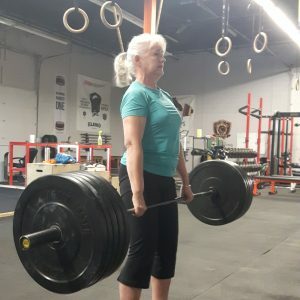 She pushes herself each workout, and has been consistently training here at Radix 2x/week for over a year and a half. Sharon wanted to continue her positive results while away for a 2 month road trip across the country with her husband. Frazer gave her a kettlebell and some dumbbells to take with her in the RV, along with an ab mat and a skipping rope! She did pushups and step ups on picnic tables and maintained her 2x/week training while seeing the country. Sharon is an inspiration to people of all ages and a pleasure to train! Keep up the strong work!